Neck pain can cause debilitating and extremely uncomfortable sensations, especially if the pain stretches from your neck down to your shoulders. According to the American Physical Therapy Association (APTA), approximately one-third of the population will experience neck pain in any given year. It can get worse if left untreated, and in severe cases, surgery may even be needed. Your neck is an integral area of everyday movement, and sharp pains can prevent you from functioning properly in your day-to-day life. Whether your neck pain presents difficulty when trying to sit up straight in your chair at work or tilting your head down to tie your shoes, physical therapy can help get you back to a normal, pain-free function. Many people are able to find relief from their neck pain every year through the help of physical therapy. Our physical therapy practice is dedicated to providing you with the relief you need. If you are suffering from neck pain, request an appointment from Partners in Physical Therapy today! Injuries. Whiplash is one of the most common injuries that results in neck pain, typically sustained by an automobile or high-impact sport collision. This is known as a “strain” injury, causing the head to whip rapidly back-and-forth, thus affecting the soft tissues in the back of the neck. Muscle strains. The muscles in your neck can become strained by overuse. Even something as simple as sitting at your desk all day with your neck craned toward the computer screen can lead to a strain in your neck muscles. Illnesses. Certain diseases and ailments can result in neck pain, such as rheumatoid arthritis, meningitis, or cancer. Joint degeneration. Much like any other joint in your body, the neck joints can erode with age, causing pain. Conditions such as osteoarthritis can also reduce the cartilage between the vertebrae in the neck, also resulting in neck pain. How will physical therapy solve my neck pain issues? According to WebMD, physical therapy is one of the best methods for treating neck pain. At Partners in Physical Therapy, our physical therapists will conduct an initial physical evaluation to analyze the range of motion in your neck, as well as any limitations you have due to your pain. They will then create a diagnosis that will determine the make-up of your treatment plan. You will work together to understand the goals and expectations of each step in your individualized treatment plan, with the main focus being overcoming neck pain and recovering as quickly as possible. Treatments for your neck pain will most likely include manual or “hands-on” therapy, which consists of special techniques designed to reduce stiffness of your neck and improve its range of motion. 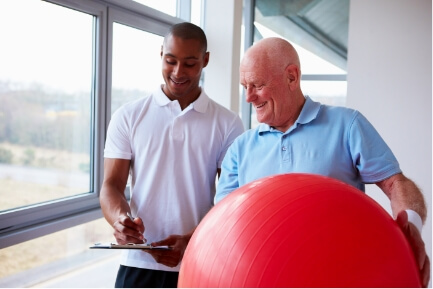 Our physical therapists will also provide you with targeted exercises that will strengthen, build, and improve the muscles and tissues in your neck. We will focus on improving your posture to aid in the recovery of your neck muscles, as well as avoiding re-injury in the future. Additional treatment services may include ice and heat therapies, ultrasound, or electrical stimulation, as our physical therapist deems fit. Don’t let your daily discomfort be a pain in the neck any longer. Contact our office Lake Charles, LA to speak with one of our licensed physical therapists today and schedule your initial consultation! Get neck pain relief with the help of physical therapy. We will help you get started on the road toward long-lasting pain relief.